PDF is one of the most widely used document formats these days. While PDFs are generally meant to be read, not edited but there might be some reasons that you might be looking for a tool to edit a PDF file. There are plenty of free and paid PDF editors available that lets you edit your PDF files in a jiffy. Usually, the free PDF Editors lacks some essential professional features and are not optimized for larger files and processing. Also, the free variants do not offer support for other formats making it a little difficult to work with other formats. Rather than using multiple tools to do your task, I believe you should have a one-stop solution for all your PDF related requirements. In this post, we’ve covered some of the best paid PDF editor software for Windows 10/8/7 that comes with some amazing features. When you decide to go in for a paid software, you have to ensure that you are getting your money’s worth. It is therefore imperative that the PDF editor software has all the features you need. Wondershare PDFelement Std is one of the best PDF editors available. Available in both standard and professional variants, PDFelement is the most professional tool that you can consider buying. It offers a tremendous number of features in both standard and professional variants. The best part about PDFelement is the GUI (Graphical User Interface). 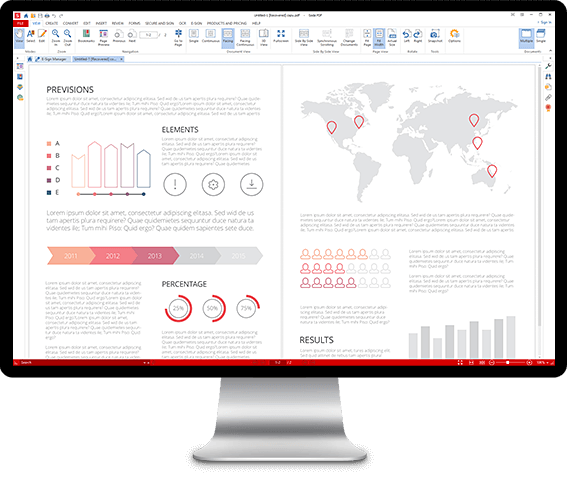 The Microsoft Word looking UI is very simple and easy to use, giving you the best possible experience in editing PDF files. To get started, you can open existing documents or start creating PDF documents from scratch. If you are editing a document, you can simply select anything you want to edit and then use on-screen controls to make changes. Moreover, you can even edit graphic-based objects by simply selecting them. If you are a professional, then the security of your documents should be a prime concern. With PDFelement, you can ensure proper security by password protecting and signing your documents. Signing your documents ensures that the files cannot be tampered or edited by any other tool. PDFelement Standard is quite affordable; you need to pay $59.95 for a single PC professional license. The professional variant – Wondershare PDFelement Pro comes with additional features that are quite useful. An outstanding feature that comes with this software is OCR technology. PDFelement 6 Professional lets you work with your scanned PDFs and search text, edit photos and do a lot more. The automatic form recognition technology makes it a lot easier to work with PDF forms and extract information from the forms. If you work with a lot of PDF files, then professional variant might help you with its batch processing features. And the file size optimization ensures that your PDFs are always ready to be shared via any medium. PDFelement Pro also lets you remove any sensitive content from your official files using the redact feature. PDFelement Pro 6 is a great addition to the standard variant and offers some very useful features that are not available in any other PDF editor. The tool costs around $89.95. Foxit, a name known for its free Foxit Reader, has brought us a lot of useful PDF tools. PhantomPDF is a great PDF software with a lot of capabilities. 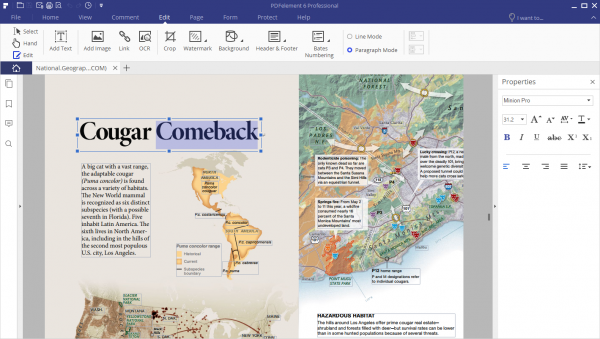 Other than basic editing features like changing text, editing graphics, Phantom offers good collaboration and cloud support. You can easily edit, organize and manipulate your PDF file. You can export them as different formats or merge them with existing PDF files. The editing features are quite easy to use and easily understood. 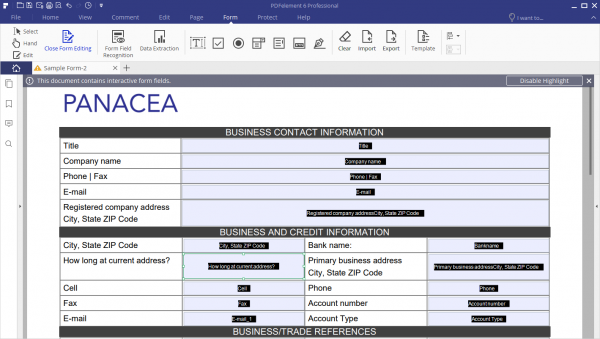 Foxit offers cloud services and collaboration features under a name called ConnectedPDF. ConnectedPDF lets you give other users access to your files. You can revoke this access at any time. Document owners can specify editing and reading rights for other users. The inbuilt version control lets you see how the file has evolved. All the participants can comment and communicate using the tool itself. ConnectedPDF is a great way of collaborating; it helps you track document usage, get notified of new updated and allow collaboration reviews. Foxit PhantomPDF offers both a subscription model and a one-time purchase. PhantomPDF Business can cost you around $8.99/mo or $159.00 for a single time purchase. 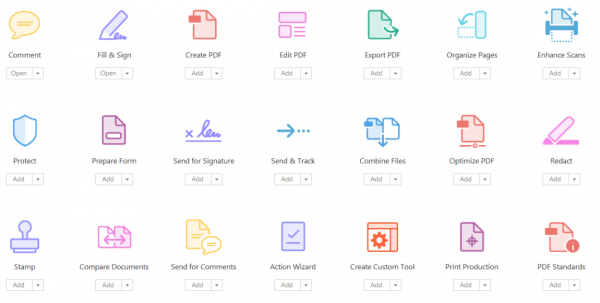 Adobe, the company behind PDF files, brings this tool that lets you edit, share and sign them. Acrobat DC offers all the editing features that you would ever need. You can create PDFs, edit them, export them as other formats or generate PDFs from existing documents in different formats. Adobe Acrobat DC is quite different to use in comparison to other tools in this list. The UI is neatly designed and even supports touch-based devices. The tool center can help you quickly find the right tool for editing your PDF file. Talking about security and signing features. Adobe Acrobat DC offers some great security features. You can sign, certify and verify your documents at one place. And moreover, you can even collect e-signatures from other users and track responses in real time. Adobe Acrobat DC also follows a subscription model and can cost you around $180 for an annual subscription. 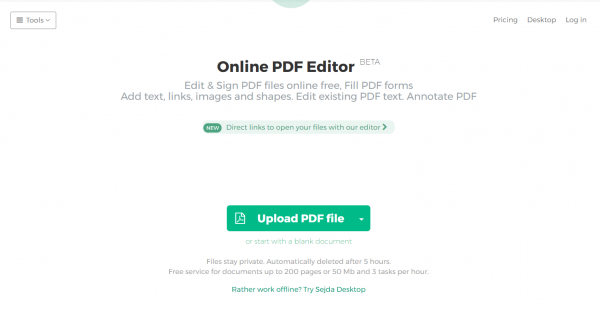 Sejda PDF Editor is a subscription-based online PDF editor. A monthly subscription gives you access to all its online features for one month. You can perform most of the tasks and that too from your web browser. To get started, you need to upload your PDF file. Or you can get started with a blank PDF. Once the file is processed and loaded, you can start editing the contents. You can add text, links, edit images, annotate PDF and do a lot more. Sejda also lets you sign your PDF documents; you can either type your signature, draw them using the touchpad or upload any existing signatures if you have. Overall, using Sejda is a great experience. It gives you most of the features plus the flexibility of using it from any device. 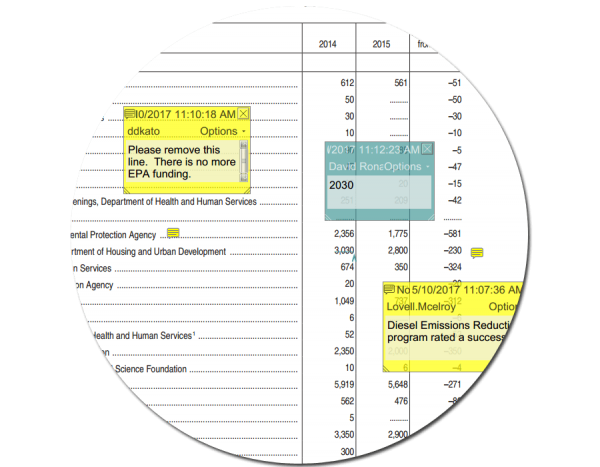 Monthly Subscription for Sejda PDF Editor can cost you around $6/mo or $4.20/month if billed annually. PDFBuddy is yet another online PDF Editor application. It gives you access to all the editing features right from your web browser. 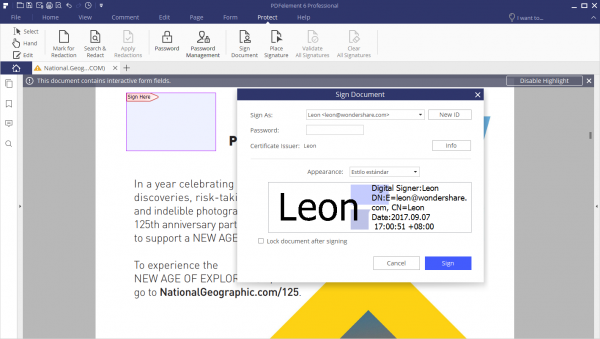 You can transform, add text, use the pen tool, highlight, add symbols and add signatures to your PDF. You can save the changes and store the PDF in the cloud or download it directly from the editor. 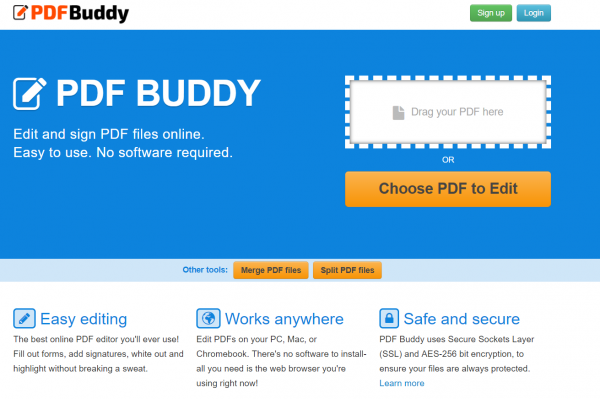 PDFBuddy can cost you around $7.99/mo for an unlimited package. Pay-as-you-go plans are also available. Soda PDF is a PDF editor that comes in both native application and web-app variants. Available in three plans, the premium plan gives you access to most of the features in both the variants. Other than basic editing features, Soda PDF gives you review tools and ability to create PDF forms, add signatures, and use OCR as well. Soda PDF Premium costs around $84 for a year. So, these were some of the best-paid PDF editors available for Windows. These tools compete edge-to-edge and are always being updated with latest features to match the standards. Coming down to the price factor, Wondershare PDFelement Pro 6 offers a great value for money for the number of features it has to offer. For all these tools, you can even get better discounts if you purchase multiple licenses at once. Good coverage (both Lavish Thakkar here and Elise Williams in another software review column) for Top PDF Editors reviews. It’s a joy to work with PDF files using PDF-XChanger Plus (never again will use grossly overpriced Adobe). PDF-XChanger Plus is a top-notch PDF editor, excellent customer service, and does anything with PDF. Reasonably priced at $54.50 (no monthly), and a very favorable discount if you are in education (which I was initially drawn to). PDF-XChanger Plus has a fantastic set of PDF tools. Did it include one or more links? Because Links advertising shareware are likely to get auto-deleted or moderated by the commenting admins. Thank you for letting me know (I included a link). Lavish, thanks for explaining why comments may be removed, when using links. Sometimes we only want to share, not sell and forget about shareware. Heavens, The Windows Club is a free online source and uses advertising to support your website, etc. Also, thank you for taking the time to share all of these PDF Editor programs with the readers. Your research saves me time and energy. I appreciate what you do.